Thanksgiving is just around the corner! How are you dressing up your table? There’s no doubt that the main attraction on any Thanksgiving table is the food. All manner of dishes – roasted, baked, broiled and steamed – somehow need to squeeze onto a table between the place settings. While all the delicious food is a sight for hungry eyes, a floral element will keep the mood going even after the food is all gone. In past posts, Getting Back to Happiness and Scent and Memory – Starbright explored studies that tested the effects flowers have on mood and memory. The findings were pretty conclusive and crucial for any host or hostess to keep in mind. Not only do flowers make people smile more often, they also tend to make experiences more memorable (especially for your elderly guests). When you’re planning florals for the table, begin with how much room there will be, what the color theme is, and what kind of style is preferred. Long and low arrangements are fantastic for a rectangular table. 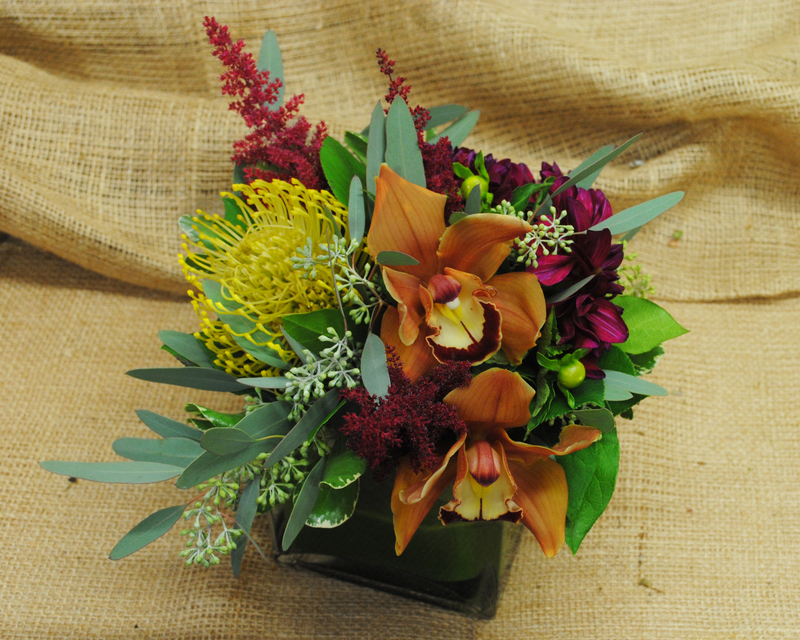 These arrangements look great when they’re filled with lush, colored flowers with a lot of texture. If you have a more intimate evening planned, an arrangement in a square vase, like the one above, can pack the same amount of presence as it’s long and low cousin. The best part, these centerpieces are still low enough that they won’t get in the way of conversation. Hosting a party can seem intimidating. One of the tips we often share with nervous dinner party planners is the power of a name card. A hostess or host’s duty is primarily to make their guests feel welcome – their ultimate tool for accomplishing this? A little place card that helps guests identify their “space” for the evening. Whether the seats are assigned or open to whoever lands there first, guests will appreciate the chance to mark their spot for the evening. In the twenty plus years that Starbright has been working in the floral industry, we’ve seen all manner of fun place card holders. Some of our favorite techniques have involved holding the cards up in the quills of a pincushion protea, between the lobes of a living succulent, or cleverly attached to apples or mini pumpkins. Matching the cardholders to the centerpiece will keep things looking consistent. It can also be fun to play with placing other floral elements around the house. 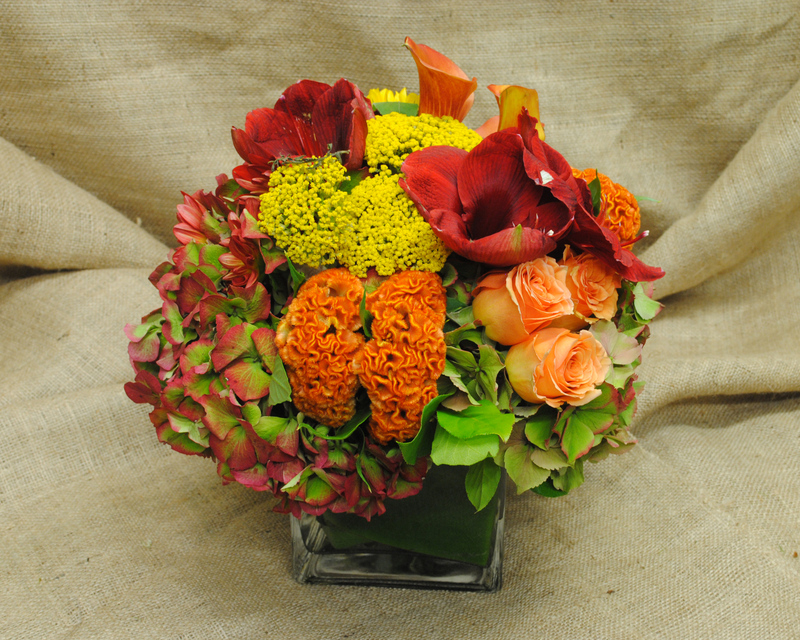 Bud Vases like the below, can be filled with flowers that match you centerpieces and set around the home. 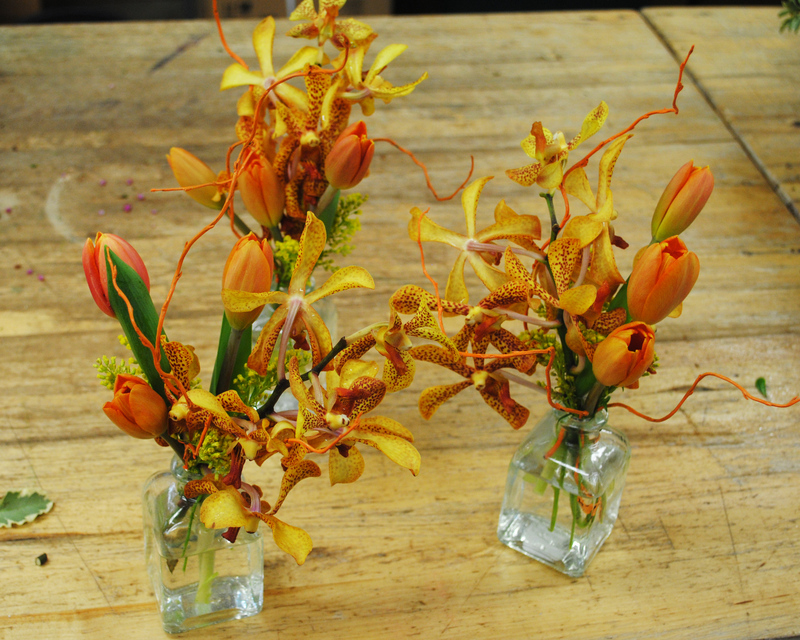 Bud Vases are a great way to subtly stretch your floral theme beyond the dining room. Or for the traditionalists – the true symbol of the season, a cornucopia, is a great way to dress up a coffee table of sideboard. Here in New York City, it’s easy to forget about the fields that have been harvested, the geese migrating south for the winter, or the smell of leaves. 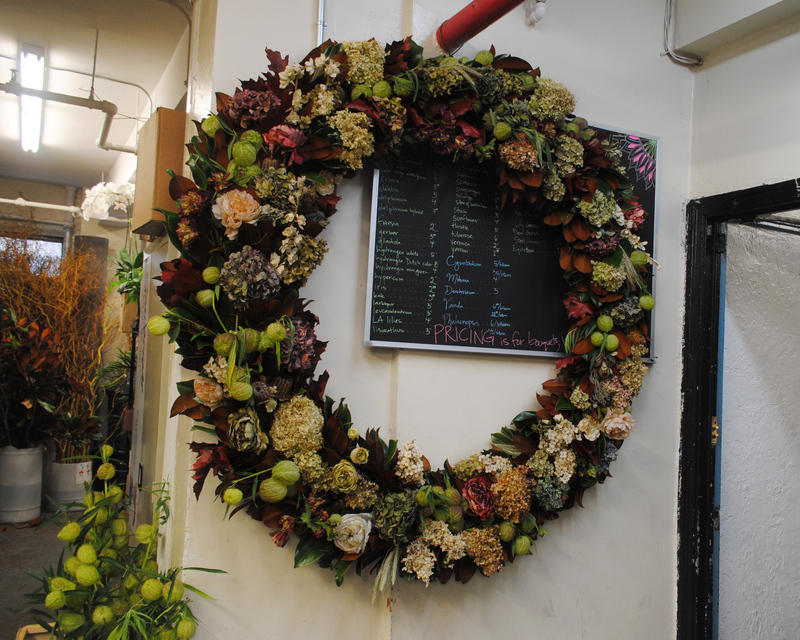 One of the best ways to remind people of the season is with a fall wreath to greet guests at the door. We like to welcome our seasonal visitors in a BIG way! 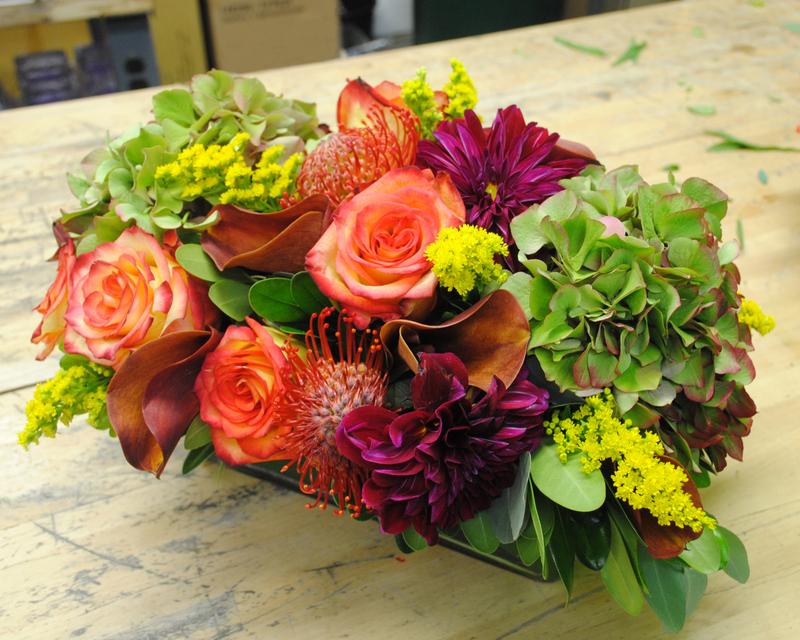 Whatever your theme or floral strategy – Starbright Floral Design is looking forward to helping you dress up your dinner! Previous Previous post: Brightening Up With The Chrysanthemum.